This page groups some of our events into “projects” so we can share some of the larger themes we investigate and reveal some of the deeper aspects of NMNC’s core that may go unnoticed by concertgoers. Part of New Music New College’s mission is expanding the concept of music and exploring new means of performance, often by challenging the traditional performer/audience hierarchy. 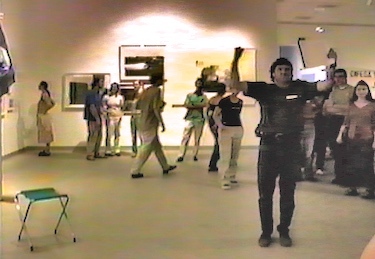 Our very first event, a performance of John Cage’s Song Books in 1998, was a watershed moment, demonstrating the power of extending techniques used in composition/realization into the realm of performance practice. The Song Books presentation took place in an exhibition of Joseph Beuys’s multiples at the Ringling Museum of Art in Sarasota (next to the New College campus), and involved five performers aided by four technicians. All wore stopwatches, and the performance, timed to the second, lasted exactly one hour. While each technician was responsible for a fixed station with audio equipment, the performers moved throughout the entire space individually. The audience members were free to roam throughout the space and shape their own experiences, and we discovered that our extending the indeterminacy Cage built into the composition to the audience led to a host of individualized experiences. In this way our audience became a vital part of the performance. NMNC staged the Song Books again in 2010, this time with performers and audience roving the entire ground floor of College Hall, then adapted the performance for a reprise in the Ringling Museum's Searing Gallery. Read more here about our numerous experiences with the Song Books. Building on this experience New Music New College has presented many works over the years that involve experimentation in all facets of realization. Several times, for example, we have presented Cornelius Cardew's transcendant work The Great Learning, Paragraph Seven, where vocalists and audience members mingle throughout the performance space, both in workshop and in concert forms. In 2018 we staged a massive outdoor work, with twenty-seven performers ranging over all the balconies of both wings of New College's ACE Academic Center building and the audience roaming through the adjacent Koski Plaza: It's Alive! A Monstrous Circus On Frankenstein. Using Frankenstein (in the 200th anniversary of the publication of Shelley's first edition) as the base text for John Cage's experimental work Circus On we created a unique monster of our own. Another periodic focus of New Music New College is vocal music, especially music that goes beyond the concept of traditional singing. Some examples of this are our performance of Karlheinz Stockhausen's Stimmung (2001), our Speech Acts concert (2000), and visiting artists Pamela Z (2010, 2015), Toby Twining Music (2014), and Ekmeles (2015). In February of 2009 we presented our first Crossroads concert, a collaboration between NMNC and the Sarasota Orchestra that paired Orchestra principals with New College student rock bands outdoors, with the audience in the center of the performance spaces. Culminating with a reorchestrated version of Stravinsky's Right of Spring (complete with dancers from Sarasota's Fuzión troupe snaking through the audience space), the concert proved so successful that we used it as a template for Crossroads concerts the four years following. Our final grouping of works are those that seek to use social interactions to make music and, conversely, to use composition and performance to define or highlight social space. Beginning with our presentation of Pauline Oliveros's Sonic Meditations in the Blurring the Boundaries exhibition of installation art in the Ringling Museum (1999), these projects also include the Social Studies Project (2003), the piece Hocket Science (part of 2004's From the Laboratory: New Experimental Works concert), Playspace (2008), and Living and Dead: The Gettysburg Project (2009).